This last Major League Baseball offseason was a difficult one if you are a Texas Ranger fan. Not only did Texas not make it past the wild card round or win the American League West, they also lost two fan favorites in Josh Hamilton and Mike Napoli. With the way last season ended, the Rangers’ home opening series against LA could not come soon enough. The opening home series scene was something that I now know that everyone needs to experience at least once. I don’t know if it was the hunger that needed to be filled from no baseball in five months in the atmosphere or just the smell of charcoal grills being lit at ten in the morning. The tailgating crowd in my opinion didn’t skip a beat, even with the new rule stating that you must have a ticket to tailgate and park near the stadium. If you haven’t ever tailgated for a baseball game, I’ll tell you right now that there is nothing that will satisfy your lunchtime hunger more than a brat and cold Shiner Bock beer. Something about assorted meats and beer just go hand-in-hand with the great American past time. Day games in April are perfect for taking the family or a significant other also. Especially here in Texas, where we have to worry about sitting in 100-plus degree heat for most of the season. However, for this game I didn’t have to worry about that due to my luck of knowing someone who has a suite at the ballpark. And let me tell you, I don’t know if I’ll ever be able to return to a normal seat after this trip. Sitting in the suite area behind home plate I got to experience a baseball game like I have never experienced before. Air conditioning, catered food and almost any drink you could think of was available. The fact that I was going to get to boo Josh Hamilton was just a plus. The game didn’t start exactly like I had hoped. 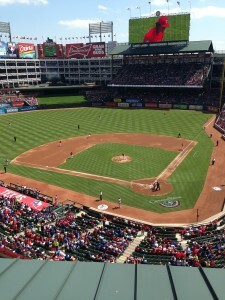 The jet stream in right field at the ballpark in Arlington was in full effect. 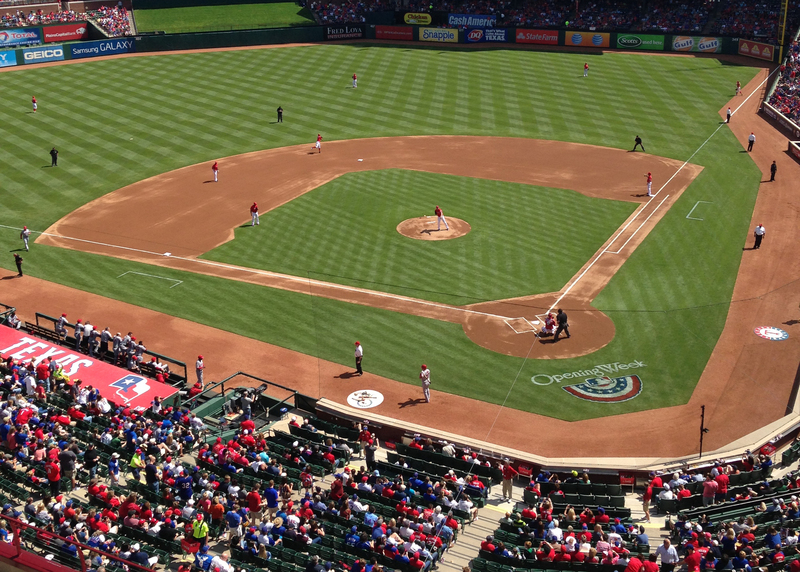 Albert Pujols and Mark Trumbo both hit two run home runs in the top of the first off of the struggling Matt Harrison which somehow didn’t silence the Texas crowd. Hamilton scored on the Mark Trumbo home run after walking. Whenever he approached the plate the ballpark erupted in boo’s and it was something I hadn’t heard for myself before. True hate and despite for someone that a city loved. You could tell the town was hurting within those ten seconds of booing. They didn’t care if the Rangers lost 20 to zero, as long as Hamilton didn’t have anything to do with it. Well, I will say we did get to see that. Hamilton finished the game 0-4 with a walk. Other than that there wasn’t much to cheer for if you were a Rangers fan at the game as Texas lost 8-4. Matt Harrison dropped to 0-2, Beltre still not hitting as well as we all want and Leonys Martin yet to do anything significant. The season is still very young and all Rangers fans have hope that they can pick up where they left off, consistent post-season contenders. For all Rangers fans out there, attend a game this year, support your team and let Josh Hamilton know first-hand that this could one day be a baseball town.